Random Thoughts... I wanna hear 'em! Re: Random Thoughts... I wanna hear 'em! If you cut off my head, what would I say? "me and my head" or "me and my body"? Take out my stomach, my kidneys, I say "me and my intestines.". What right has my head to call itself me? Quit why you're a head. Why must e coli take away all my lettuce? Bit of a show stopper that one Otter. Garnered me a smattering of applause when I performed the self-written scene for the Plastic Fanny Theatre Troupe, Milford-on-Sea. Improvise they said. And so I did. 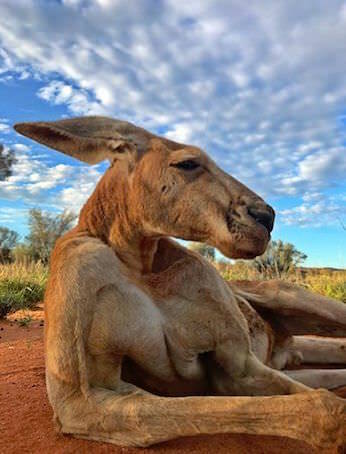 Roger: the Jason Statham of kangaroos. I met Brian Eno in a Dublin pub, once. He had just come back from New York after Lou Reed died. For some reason, he was obsessing about American breakfasts. So it's Brian Eno, let him talk about what he wants to, he has enough sycophants, right? But man did he go on and on about it. And corned beef hash! Oh my God! Soggy and greasy. Crispy with an egg on it. Cold leftovers. Warmed up leftovers. Hot from the grill! WTF? Finally, I said I had to go but he seemed eager to have one last pint. Almost immediately he started in on eggs! I tossed back my Guinness like the good Irishman I am not and legged it for the bus to Kilkenny where I was staying with my friend Eberts.